MQ: Just what is the MQ, other than a catchy title? 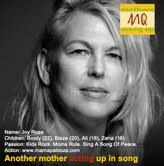 The MQ is the Mothers Acting Up Questionnaire, promoting Mother Activism by sharing the passions and actions of mothers*. We’re living in an historic time of change, as mothers shape our world in powerful new ways, from economic decisions at home to international decisions about who and what gets protected, and who gets educated. As mothers (and others) realize that our children’s lives are entirely intertwined, a global community is uniting to secure the well-being of all children. Think a multi-hued, multi-sized, multi-linguistic, delicious sea of strength, wisdom, and generous conviction. Think voters, consumers, elected leaders. Think unstoppable. The MQ is a celebration of this sea-change. May the MQs inspire and encourage you; calling you to action on that issue you’re passionate about. Read all the MQs below, and please write beheard@mothersactingup.org with ideas and nominations for whose MQ you’d like to read. A: The creativity and awe of seeing them become their own people and grow into the world. The circle of love we share… that and cooking for them. Food is love. What 140-character tweet—or ten-word sentence best describes a mothering skill YOU have that you wish every world leader possessed? A: The planet is our great mother; we owe everything to her. What we put into the ground, air, and sea comes back to us as our living home. What would you want to whisper into the ear of every child in the world? A: You R loved. When I know my children are in need, I DO whisper in their ears at night whatever message they most need to hear. I repeat it three times, softly invoking a spell — but the words, You R Loved, never grow old. What issues keep you up at night? How do you respond to these nocturnal musings? A: Bombs, Bureaucracy, and Pollution. I act in ways according to my highest purpose and then I pray! How do you stay exuberant when addressing the sobering realities facing children? Which mother leaders or activists inspire you and why? A: Every mother inspires me, but the great feminists are my true inspiration. You have an opportunity to meet with the President on behalf of the world’s children. What single request do you make? What individual or group do you invite to join you, so you’re invincible and win the support of the White House? A: I’d bring Moms Rising because they’re politically savvy, and I’d also bring up issues of pollution. We need to clean up our mess and live more sustainably immediately. What issue are you embarrassed you don’t know more about? A: Nothing embarrasses me. If I don’t know it, then I know plenty of people who are much smarter than me on that issue and can share their knowledge. You’ve been chosen to be the face of Mothers Acting Up—celebrating mothers taking public action on behalf of the world’s children—to shine from the side of every bus in America. What’s your tag line? A: Kids Rock. Moms Rule. Sing A Song Of Peace. How do you share your activism with the children in your life and how do you think it has shaped them? A: By example; they see ‘feminist family values’ and a sustainable lifestyle at work every day and long into the night. What moment did you first feel moved to take a public action, and begin your journey as an activist? A: The moment I realized my children were going to inherit the world, back in 1989, after the birth of my first child. A friend leaves an excited message asking you to join her in an action. What do you hope it is? What do you pray it isn’t? A: Sharing a story or a blog is easy. Attending a meeting is harder. How do you benefit the world’s children? Does it involve contributing to individual lives or changing systems, or both? A: Both. But, I also believe, ‘We talk so much of better babies while we hear practically nothing of better mothers’. Until our value systems begin to elevate mother-work we are limited in our power.